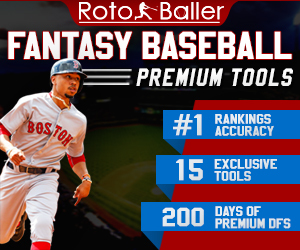 We continue our look at RotoBaller's Standard Mock 2.0 with a recap of rounds 2-3. 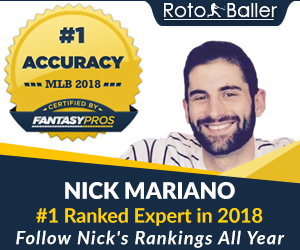 We recently gathered 12 RotoBaller experts writers to conduct a week-long, email draft, MFL10-style, in order to evaluate ADP values and draft strategies in standard scoring fantasy football leagues. If you didn't catch it earlier, start here with our first round analysis. 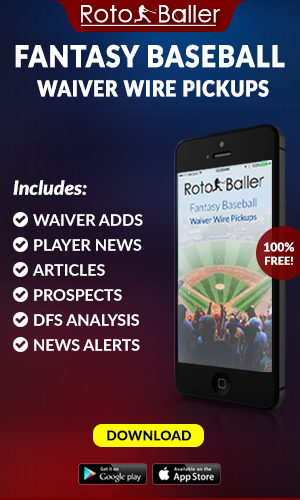 We're breaking down every round, continuing with the second and third rounds in this article. The round kicked off with Aaron Rodgers going first, the first quarterback to come off the board. After the selection of Rodgers, the round was dominated by running backs and wide receivers. Amari Cooper and Jordy Nelson going back-to-back is a wonderful juxtaposition. Cooper is the young gun being drafted on the potential of what he could become while Nelson is the grizzled veteran, trying to show that he still has plenty of gas left in the tank. Both are solid picks and it really just depends on your roster-building preference. Devonta Freeman at 2.04 kicked off a run of six straight running backs. Getting Freeman in the second round is a great value as he generally is coming off boards in the middle of the first round. DeMarco Murray should serve as Tennessee's lead back for another season while Jordan Howard is locked into an every down role. He may regress from his super-efficient 2016 season but workload alone keeps him in the second round. Todd Gurley is a popular second round running back who may benefit from Sammy Watkins taking defensive attention away from the running game. Three more receivers finished off the second round in Dez Bryant, T.Y. Hilton, and Brandin Cooks. Bryant, and the Cowboys, should be forced to pass much more often than they did in 2016 as they had one of the easiest schedules last year and a much tougher slate of opponents in 2017. When Bryant is healthy, he's one of the most dominant touchdown-scorers in the league. Hilton causes some concern because of the uncertainty surrounding Andrew Luck's shoulder. Of course, if Luck starts the season then the late second round is a great value for Hilton. Cooks should continue his boom-bust ways with the Patriots. Pair him with a steady, consistent WR1 like Antonio Brown or Odell Beckham in the first round and you are set at the receiver position. Devonta Freeman (RB, ATL) - Freeman, as mentioned earlier, usually comes off boards in the first round after the big three running backs, LeSean McCoy, and Melvin Gordon. Freeman finished 2015 as the number one overall running back in fantasy and is in line for another big season for the Falcons. 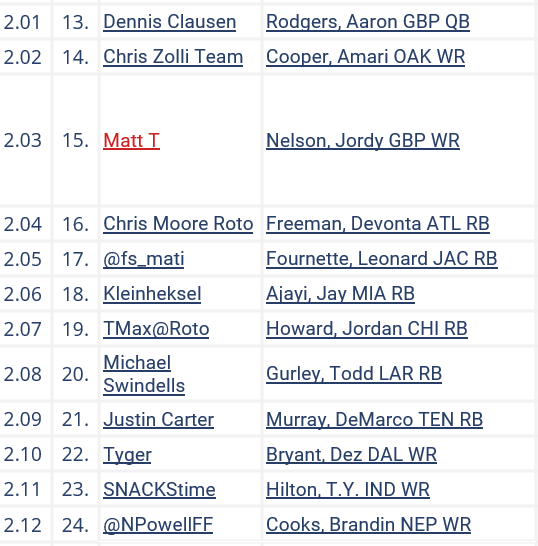 Aaron Rodgers (QB, GB) - Rodgers in the second round is in line with his ADP date but I'm simply not a fan of taking quarterbacks early in fantasy drafts. That being said, he provides a big advantage over any other quarterback available, especially with Andrew Luck's health looking shaky. If taking a quarterback early and not having to worry about the position all season is your cup of tea, Rodgers is the cream of the crop. Round three provided plenty of variety. In all, two quarterbacks, two tight ends, four wide receivers, and four running backs come off the board. DeAndre Hopkins looks to bounce back after disappointing in 2016. He will have either Tom Savage or Deshaun Watson throwing to him in 2017, an upgrade over the departed Brock Osweiler. Travis Kelce was the second tight end off the board after Gronk went in the first. Kelce is coming off a career year which saw him finish as the TE1 in fantasy. With Jeremy Maclin gone, Kelce should see all the targets he can handle. Of course, those targets are coming from the arm of Alex Smith so Kelce's touchdown scoring upside is capped. Veteran signal callers Tom Brady and Drew Brees went within two picks of one another. While they are getting up there in age, there's nothing to suggest they don't have at least one more elite fantasy season left in those arms. Isaiah Crowell has RB1 upside as he will run behind one of the top offensive lines in football. Jordan Reed's selection came despite the news of him fighting a lingering toe issue. If healthy, he can push Gronk for the distinction of being the top overall tight end in fantasy. Sammy Watkins was still a Buffalo Bill when @fs_mati selected him. Since then he's seen his ADP tumble into the fourth round. He's still a value as he will play for new coach Sean McVay, who's much more pass oriented than the Bills ever were while Watkins was there. I considered both Keenan Allen and Allen Robinson with my pick in the third. I actually like Keenan more but Robinson had the higher ADP at the time. The gamble paid off as I wound up still getting Keenan Allen in the fourth. Doug Baldwin is rock solid in the third round. Annually undervalued, he's a WR1 going as a WR2 in fantasy drafts. The round ended with two rookie running backs, Christian McCaffrey and Joe Mixon. McCaffrey is a better bet in PPR leagues but he should be useful in standard leagues, as well. Don't fear training camp reports that Jeremy Hill will be the Bengals' starter. Head coach Marvin Lewis is known for making rookies earn their way into starting roles on his teams. More concerning for Mixon is whether the Bengals can cobble together a passable offensive line. 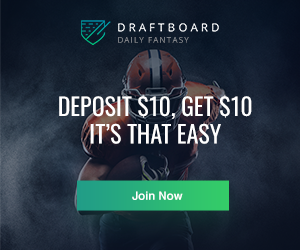 Doug Baldwin (WR, SEA) - Baldwin is consistently going off the board in third rounds of fantasy drafts, so he wasn't an extraordinary value at pick 3.09. What he is, however, is an extremely consistent wide receiver with WR1 upside in a round littered with potential land mines at the position. 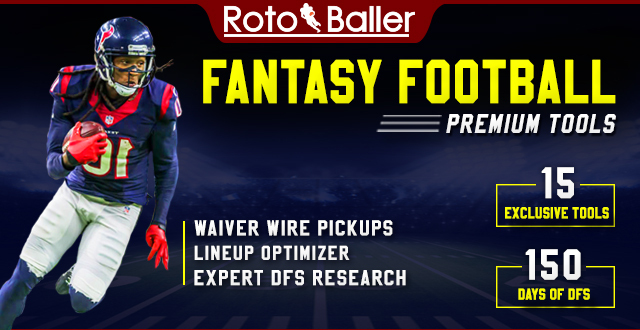 Outside of Baldwin, basically every wide receiver coming off draft boards in the third has some type of blemish, whether it be questionable quarterback play for DeAndre Hopkins and Allen Robinson, or a traditionally poor offense and a new team for Sammy Watkins. Baldwin is the safest pick here. Allen Robinson (WR, JAC) - I wound up drafting Robinson a full round earlier than his ADP. That being said, I believe in his talent and do believe that he will bounce back following a disastrous 2016 season. Sure, Blake Bortles is bad, but he was at the helm in 2015 when Robinson went bananas with 14 touchdowns. The Jaguars plan to run more with first round rookie Leonard Fournette in the fold, which should help increase Bortles' and Robinson's efficiency. That being said, I prefer Keenan Allen to Robinson this season. 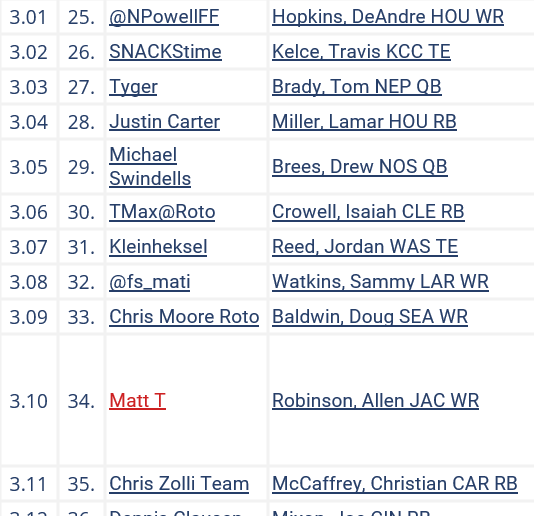 As mentioned above, I had a feeling I could wait on Keenan based on the ADP stats on MyFantasyLeague and still get him in the fourth round, which I did.